Images from the 2016 EAA AirVenture air show in Oshkosh, Wisconsin. 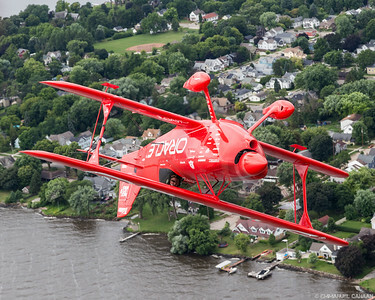 Sean D. Tucker flies inverted over suburban Oshkosh during the 2016 EAA AirVenture air show in Oshkosh, Wisconsin. 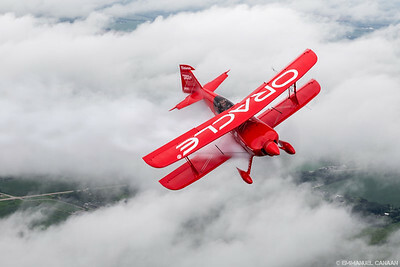 Patriotic American, Sean D. Tucker, flies over Oshkosh, Wisconsin shortly after a rain shower during the 2016 EAA AirVenture air show. 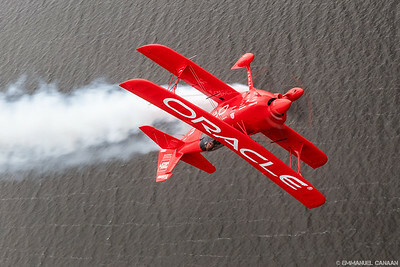 Sean D. Tucker surfs the waves of Oshkosh Wisconsin's Lake Winnebago during the 2016 EAA AirVenture air show. 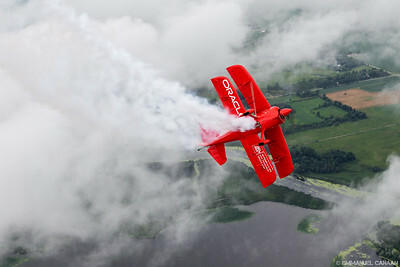 Sean D. Tucker earns some frequent flier miles as he cruises above the scattered clouds over Oshkosh, Wisconsin during the 2016 EAA AirVenture air show. 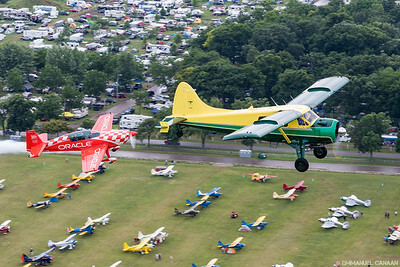 Sean D. Tucker passes over a portion of the warbirds display, as well as the east end of the North 40 campground during the 2016 EAA AirVenture air show in Oshkosh, Wisconsin. 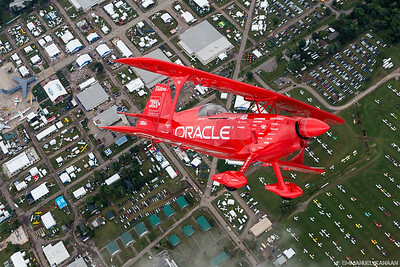 Sean D. Tucker makes a tight turn above the campgrounds of the 2016 EAA AirVenture air show in Oshkosh, Wisconsin. 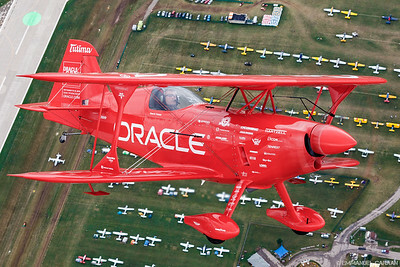 Sean D. Tucker smiles as he flies over one of his favorite places, Oshkosh Wisconsin, during the world-renowned 2016 EAA AirVenture Air Show. 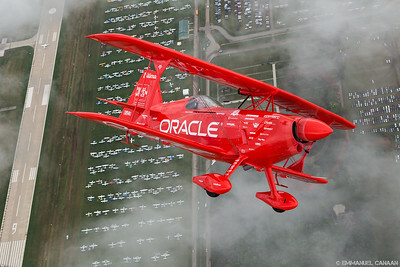 Sean D. Tucker soars over the expansive "North 40" campground during the 2016 EAA AirVenture air show in Oshkosh, Wisconsin. 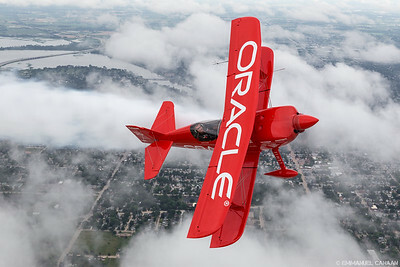 Sean D. Tucker surfs the clouds above Oshkosh, Wisconsin with the broad wingspan of his Oracle Challenger III biplane during the 2016 EAA AirVenture air show. Sean D. Tucker deftly manipulates the controls of his Oracle Challenger III biplane as he skids through the air mere feet from our photo ship during the 2016 EAA AirVenture air show in Oshkosh, Wisconsin. 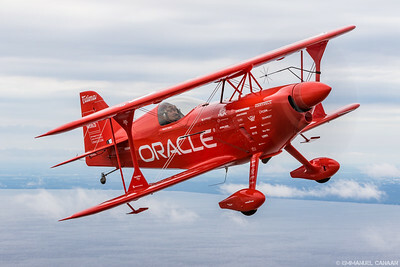 Sean D. Tucker deftly manipulates the controls of his Oracle Challenger III biplane as he tumbles through the air mere feet from our photo ship during the 2016 EAA AirVenture air show in Oshkosh, Wisconsin. The sound of superstar Harrison Ford's voice indicating that he's ready for takeoff is loud and clear in our headsets as he prepares to fly the two millionth Young Eagle during the 2016 EAA AirVenture air show in Oshkosh, Wisconsin. 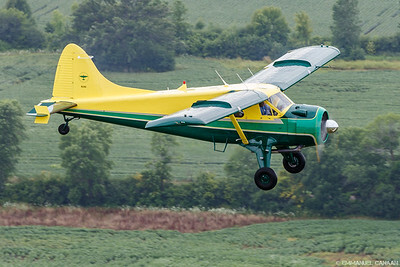 Harrison Ford's beautiful DeHavilland DHC-2 Beaver adds a splash of color to a cloudy, rainy day as he flies the two millionth Young Eagle during the 2016 EAA AirVenture air show in Oshkosh, Wisconsin. 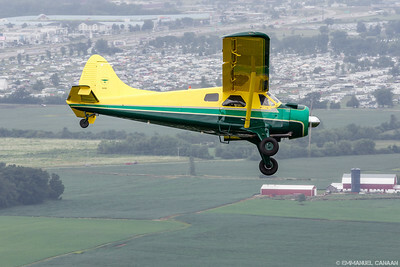 Superstar Harrison Ford cruises low over the countryside as he flies the two millionth Young Eagle during the 2016 EAA AirVenture air show in Oshkosh, Wisconsin. 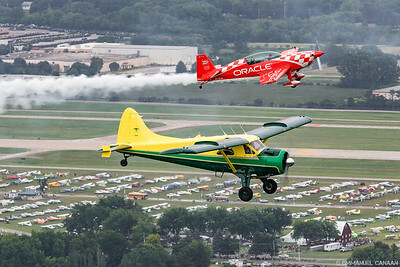 Sean D. Tucker and Harrison Ford cruise low over the air show grounds as they treat Young Eagles number 2,000,000 and 2,000,001 to their first flight during the 2016 EAA AirVenture air show in Oshkosh, Wisconsin. 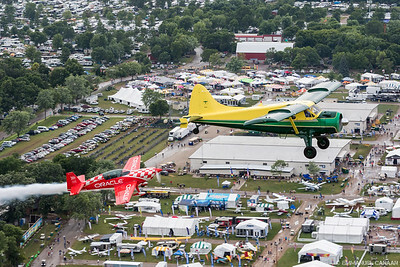 The hustle and bustle of AirVenture is clearly visible as Sean D. Tucker and Harrison Ford treat Young Eagles number 2,000,000 and 2,000,001 to their first flight during the 2016 EAA AirVenture air show in Oshkosh, Wisconsin. 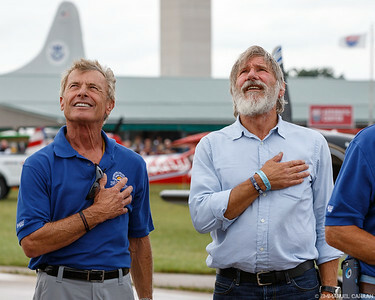 Harrison Ford and Sean D. Tucker complete the Oshkosh Run in less than 12 parsecs while they fly EAA Young Eagles number 2,000,000 and 2,000,001 at the 2016 EAA AirVenture air show in Oshkosh, Wisconsin. 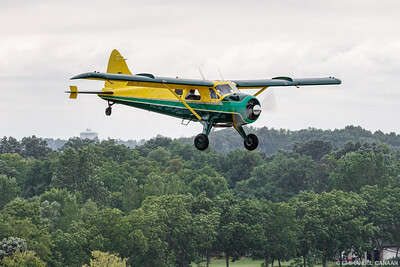 Harrison Ford takes a break from his daily driver, the Millennium Falcon, as he glides in for a landing in his earth-bound DeHavilland Beaver with the two millionth Young Eagle during the 2016 EAA AirVenture air show in Oshkosh, Wisconsin. There's only one place in the world where can you camp next to your aircraft, on the airport grounds, while watching a superstar celebrity pilot bring his beautiful DeHavilland DHC-2 Beaver in for a smooth landing. Harrison Ford is seen here at the controls with the two millionth Young Eagle during the 2016 EAA AirVenture air show in Oshkosh, Wisconsin. Many find themselves starstruck when they stare into the eyes of one of the world's most famous celebrities. 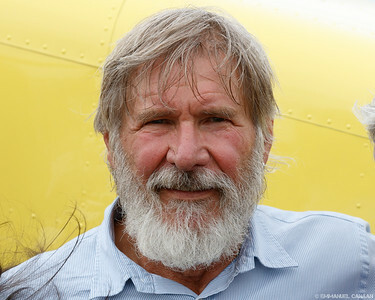 Harrison Ford is seen here after a successful flight of the two millionth Young Eagle during the 2016 EAA AirVenture air show in Oshkosh, Wisconsin. No level of celebrity is too much to stop these humble patriots from stopping to listen to the beauty of the American national anthem. Seen here are superstar aviators Sean D. Tucker and Harrison Ford during the 2016 EAA AirVenture air show in Oshkosh, Wisconsin. 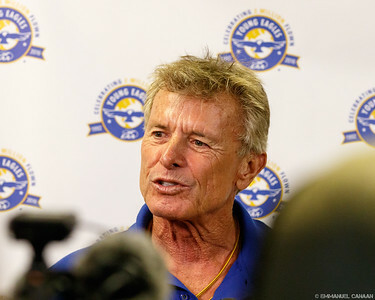 Current EAA Young Eagles Chairman, Sean D. Tucker, speaks at a press conference following the flight of the two millionth Young Eagle during the 2016 EAA AirVenture air show in Oshkosh, Wisconsin. 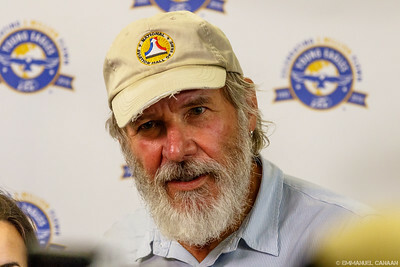 Superstar, aviator, and former EAA Young Eagles Chairman, Harrison Ford, speaks at a press conference following the flight of the two millionth Young Eagle during the 2016 EAA AirVenture air show in Oshkosh, Wisconsin. 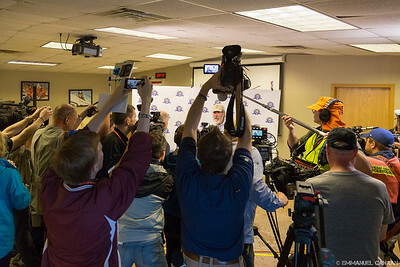 The media circus is visible here as superstar, aviator, and former EAA Young Eagles Chairman, Harrison Ford, speaks at a press conference following the flight of the two millionth Young Eagle during the 2016 EAA AirVenture air show in Oshkosh, Wisconsin. 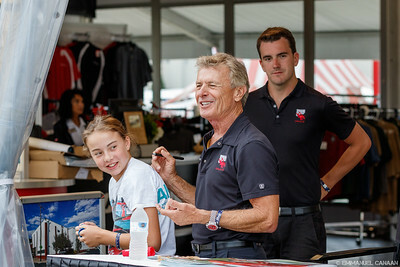 Sean D. Tucker beams as he autographs the shirt of a young aviation fan during the 2016 EAA AirVenture air show in Oshkosh, Wisconsin. Seeing the smiling faces of his fans, interacting with them, and knowing that he's made aviation special for them is one of the primary joys in Sean's life. 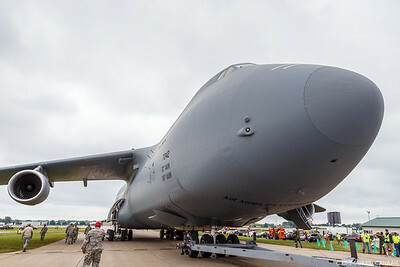 A gigantic Lockheed Martin C-5 Galaxy from Travis Air Force Base's 60th AMW fills the ramp during the 2016 EAA AirVenture air show in Oshkosh, Wisconsin. 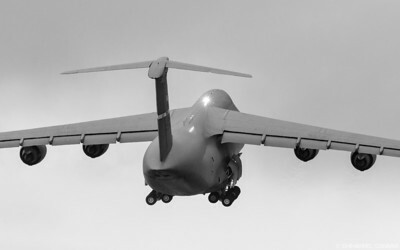 A Lockheed Martin C-5 Galaxy from Travis Air Force Base's 60th AMW roars out of Oshkosh during the 2016 EAA AirVenture air show. 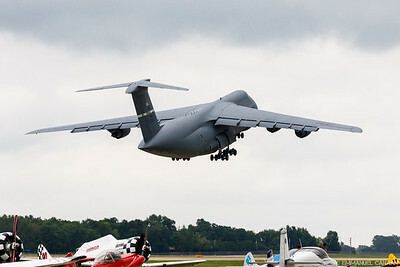 A Lockheed Martin C-5 Galaxy from Travis Air Force Base's 60th AMW climbs out of Oshkosh during the 2016 EAA AirVenture air show. 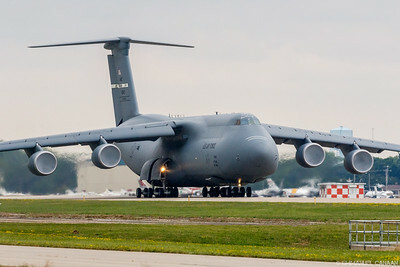 A Lockheed Martin C-5 Galaxy from Travis Air Force Base's 60th AMW lights up the Oshkosh sky with its beacon during the 2016 EAA AirVenture air show. The mammoth Martin Mars is seen here as it returns to Earth to dump a massive amount of water on a simulated fire during a demonstration at the 2016 EAA AirVenture air show in Oshkosh, Wisconsin. 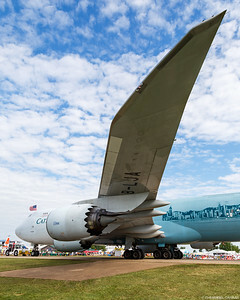 A Cathay Pacific Cargo 747-867(F) shows off a portion of its impressive 225 foot wingspan at the 2016 EAA AirVenture air show in Oshkosh, Wisconsin. 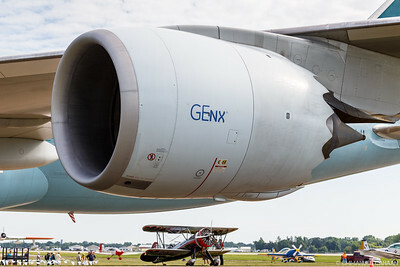 A Cathay Pacific Cargo 747-867(F) shows off just one of its immensely powerful GEnx-2B67 engines as it dwarfs all other aircraft at the 2016 EAA AirVenture air show in Oshkosh, Wisconsin. 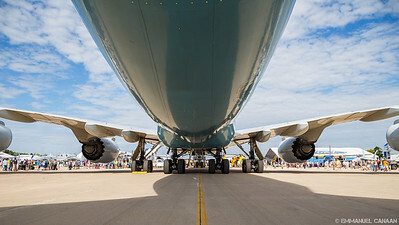 This aircraft carries four of these engines, each capable of a staggering 67,400 lbf of thrust. 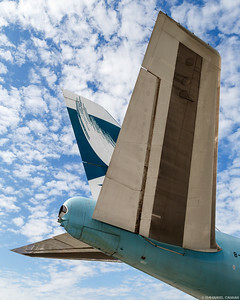 The tail of a Cathay Pacific Cargo 747-867(F) fills the sky at the 2016 EAA AirVenture air show in Oshkosh, Wisconsin. 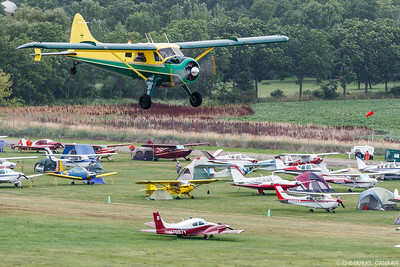 The crowd at the 2016 EAA AirVenture air show parts to make way for a mammoth Cathay Pacific Cargo 747-867(F) as it arrives in Oshkosh, Wisconsin. 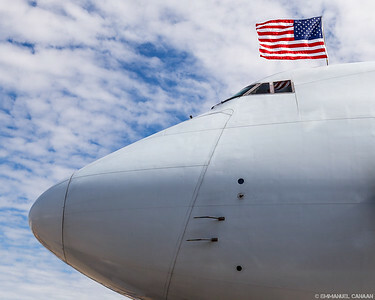 A Cathay Pacific Cargo 747-867(F) proudly flies the American flag in honor of its host country as it visits the 2016 EAA AirVenture air show in Oshkosh, Wisconsin. 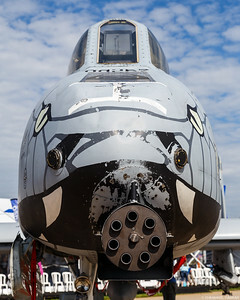 A mighty A-10 Warthog shows off a mean mug; one guaranteed to strike fear in the hearts of the enemies it faces. 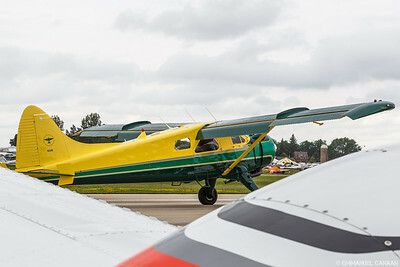 It is seen here at the 2016 EAA AirVenture air show in Oshkosh, Wisconsin. 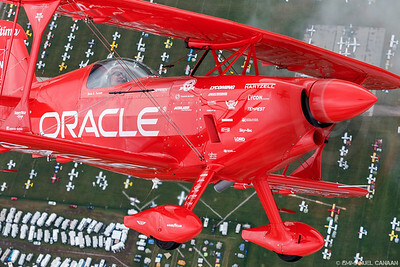 Team Oracle works with their chalet guests to prepare for Sean D. Tucker's triple ribbon cut during the 2016 EAA AirVenture air show in Oshkosh, Wisconsin. 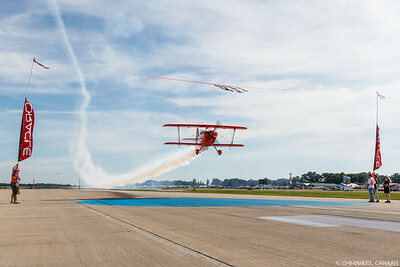 Sean D. Tucker passes under the ribbon he is about to cut during his performance at the 2016 EAA AirVenture air show in Oshkosh, Wisconsin. 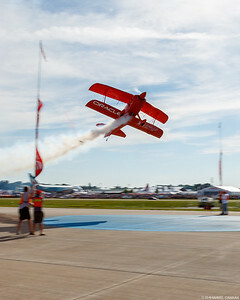 Sean D. Tucker slices and dices the final ribbon during his triple ribbon cut at the 2016 EAA AirVenture air show in Oshkosh, Wisconsin. 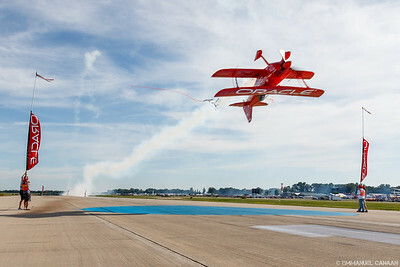 Sean D. Tucker makes a low speed photo pass after cutting three ribbons during his performance at the 2016 EAA AirVenture air show in Oshkosh, Wisconsin. 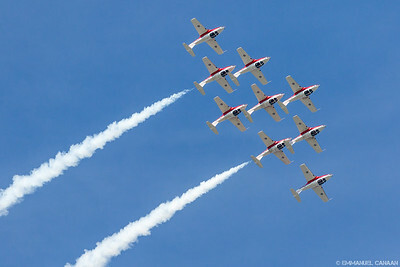 The Royal Canadian Air Force Snowbirds provide America with a rare Canadian treat as they perform at the 2016 EAA AirVenture air show in Oshkosh, Wisconsin. 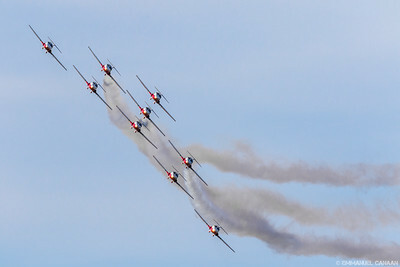 The Royal Canadian Air Force Snowbirds stack tightly as they perform at the 2016 EAA AirVenture air show in Oshkosh, Wisconsin. 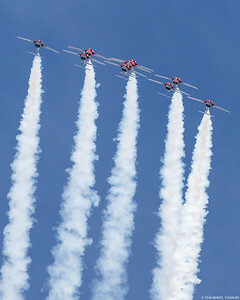 The Royal Canadian Air Force Snowbirds rise high above the crowd as they perform at the 2016 EAA AirVenture air show in Oshkosh, Wisconsin. 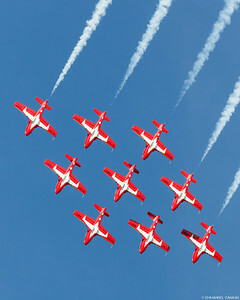 The Royal Canadian Air Force Snowbirds descend from above as they perform at the 2016 EAA AirVenture air show in Oshkosh, Wisconsin. 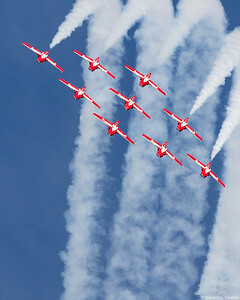 The Royal Canadian Air Force Snowbirds form a diamond as they descend from above during the 2016 EAA AirVenture air show in Oshkosh, Wisconsin. 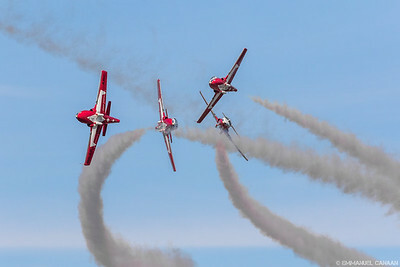 The Royal Canadian Air Force Snowbirds mix it up as they delight the crowd during the 2016 EAA AirVenture air show in Oshkosh, Wisconsin.